Of course, that project I talked about a year ago never happened and the blogging only contributed to more clutter with all the cookbooks and “props” I managed to accumulate. By far, the biggest project that day was trying to organize the cookbooks. In the end over 360 cookbooks (almost one for each day of the year!) were sorted (by color) and stored. A neater house, a few organized bookshelves, many hours and an aching back later (and thighs), I found it funny how many cookbooks I hoarded over the years. Is this where all my extra cash went to? No wonder I had no money to buy nicer clothes! I’ve noticed, through the years, I rely less and less on the cookbooks for recipes to follow but more for inspiration – whether it be a new cooking technique, an ingredient I’ve never used, or sometimes I take two or three different recipes for the same dish and come up with my own! This recipe is probably one of those “inspired from” the 15 or so Philippine cookbooks that I have. It’s my late addition to the Kulinarya Club’s July theme which is “Ginataan”. Thanks to Asha (Fork, Spoon and Knife) and Althea (Busog Sarap) who decided on using coconut milk as this month’s main ingredient. For me, coconut milk goes extremely well with the Philippine’s holy trinity of ginger, garlic and onions, sauteed and blended with a chili pepper to create a gravy base. Then I added freshly peeled prawns and spinach leaves. On top of this, I blame Shirley, who reminded me about how damn delicious Taba ng Talangka could be, so I added a few spoons of this preserved crab fat to the dish. Now tell me, who can resist this dish with a steaming bowl of rice? Add the garlic, ginger and red chili and saute for another 2 to 3 minutes. Allow the mixture to cool for a few minutes and then process in a food processor. Once done, fry the paste for a few minutes and add the fish sauce and coconut milk. Allow to simmer for around 15 minutes then add the crab fat. Add the prawns and cook for around 2 to 3 minutes and then add the spinach leaves and cook until wilted. Serve over steamed rice, top with some more taba ng talangka. Another reminder that I’ll be teaching a Macaron making class at the Essential Ingredient in Sydney on the 21st of August 2010. If you’re interested please contact them on 02 9555 8300. Essential Ingredient is located in 731 Darling Street, Rozelle. Preserved crab fat is a new one to me. Who knew you could get this by the jar? I’m keeping my eye out for it in the stores. I read your post before this wrong – sorry Trissa. Great to hear you’ll be teaching a macaron class @ Essential Ingredient. I couldn’t think of a better person to teach it! Your macarons are gorgeous – I’d love to find out what brand/type of colouring you use – as I’d like to make some baby coloured ones for a baby shower soon. Can you video tape your class? I would love to see a video of you teaching this class. I wish I could take it!!!! I love shrimp and can finally eat it again after holding off for months due to health reasons. This looks so rich and flavorful I feel like I can taste it. I haven’t counted my cookbook collection but I put 2 boxes into storage last year, so I bet it’s not far off from yours. And I don’t even have a house =X. I don’t nearly have as many cookbooks as you but I’ve discovered the same thing about mine – I don’t so much cook from them as use them as a theoretical guide for technique and inspiration! 360 cookbooks ??? holy cow ! This recipe is fantastic, I don’t know much about food from Philippines but I love these flavors; will surely givi it a go ! I have not heard or tasted crab fat! You had me intrigued about this ingredient. It’s nice to learn more about a new cuisine. I feel quite good reading this as I’ve just come down from my bedroom where I tidied up a few things that had been neglected and messy for weeks! The rest of the house though? Hmm… maybe after dinner. Or dessert. Preserved crab fat is my newly learned thing of the day. Thanks! Shut up. Preserved crab fat? Why has it taken you so long to post about this? Crab lovers need to know about preserved crab fat! on July 30, 2010 at 5:35 pm | Reply Tita Uko. This sounds just divine, Trissa! Does the taba ng talangka come in a tin? I’ll have to look for this! Good lord, Trissa. I don’t even know many cookbooks I own. A lot. About 5 large boxes when I moved last yr? Love this dish! I;m buying some prawns soon! Oh dear! 360 cook books! And I thought my collection of 40 was crazy! But I can understand the reasoning behind all those purchases. This looks so warming and comforting Trissa. The preserved crab fat sounds like an interesting component too! 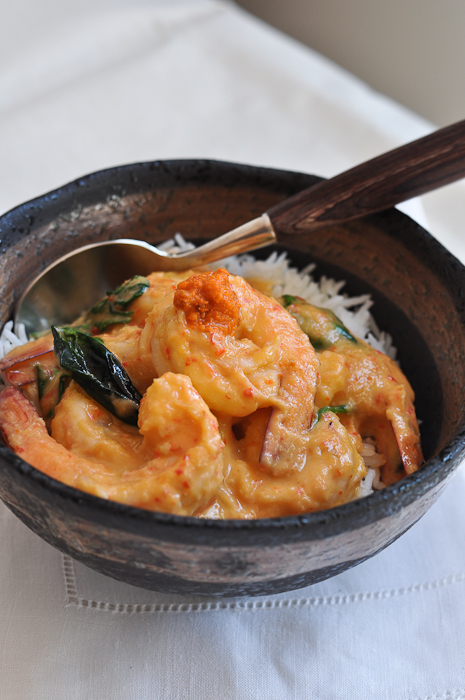 Hehe, I just made coconut curry prawns for lunch today! 🙂 But your recipe looks very tempting. I should try adding spinach leaves next time! What a brilliant idea! Wow. This looks soooo good, Trissa! I love the color for one thing and I know it has to taste divine. oh man..all the recipes with crab fat is killing me! I have to get some! Wow Trissa, I’d never heard of preserved crab fat before but it sounds so good! And prawns, mmm, how could I refuse 😛 Good luck with the macaron day ! I want some of your coconut prawns! They look scrumptious with the curry gravy. i just adore the flavors here! i can imagine this over a big bowl of couscous! Waw!! This dish makes me sing & salivate at the same time, Trissa! MMMMMMMMM,…and congrats on teaching the lovely macarons class! Too bad it is on the otther end of the world,…otherwise I would immediately attend! What a great new prawn recipe, my boy loves prawns and wishes he could have it every night for dinner. This is a new idea i can use for him. Thanks. I love taba ng talangka as wel. I used that too in my Ginattan post. Love the bowl in this post… I want to dig in and eat the prawns haha! Um, where do you add the prawns? Sorry about that – I have just fixed it up. Trissa, you’re telling the exact story of mine too, lol. This dish was “inspired from the 15 or so Philippine cookbooks”. Sounds wonderful and looks fabulous. It’s so darn pretty! I loooove your photos. They’re always so awesome! Anyway, I have come to the same conclusion about cookbooks. I started getting really into them awhile ago, but then I saw the ones sitting, unloved, on my shelves and hopped out of that addiction quickly! Sometimes, though… It is so hard to resist. MMMMMMMMM,…and congrats on teaching the lovely macarons class! too bad it is on the othet end of the world,…! Oh wow totally fascinated by Taba ng Talangka, preserved crab fat. What actually is it? Good luck with the macaron classes, how exciting. 360 cook books? Wow, that is a lot! 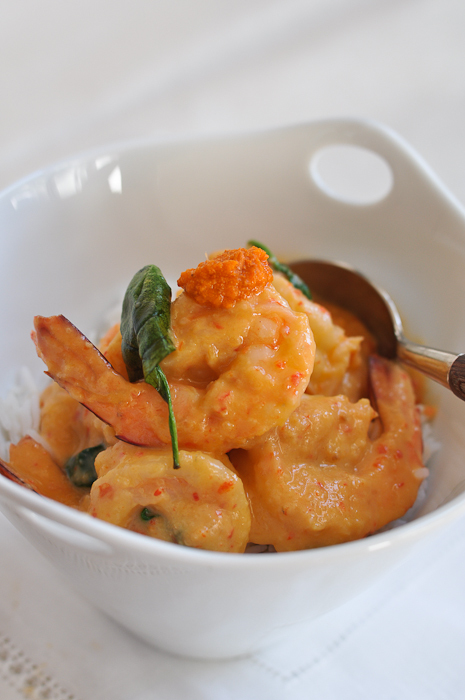 The prawns in coconut milk and preserved crab fat must be tasting so so delicious. With rice and some coriander leaves (albeit a small portion), it would be lovely – it looks fragrant and tasty! And now you’ve ensured that I do my cleaning marathon this weekend – my husband’s going away, I’ll have to put the blog on hold 🙂 and get to cleaning! Oh, why do you tempt me so? It’s not right, I tell you! I loved taba ng talangka growing up–still do–and the way you prepared it here is laughing at me, taunting me in front of my ginormous computer screen. Because I can’t have it. As if this weren’t enough, you had to post a picture of your macarons at the bottom. Not fair. I’ve been really thinking about participating in a Kulinarya event. Just not sure that my filipino cooking repertoire is wide enough. You guys do a great job! @lemonandanchovies – we’d love you to join the Kulinarya club! Great post Sis! Can’t wait to try this! Preserved crab fat? I’ve just learnt something new. I didn’t know crabs had fat! These prawns sound so delicious!